The Tubbs fire began around 10 pm in Calistoga on Sunday, October 8. The Diablo wind had been blowing dry air across the area for more than 12 hours when the first significant fire started and it carried the embers across Napa County and into Sonoma County. It was one of about a dozen large fires that were simultaneously burning in Northern California counties. Winds don’t usually top 40 mph when the Diablos are blowing, but on this night sustained wind speeds of 75 mph were recorded; in some of the canyons gusts topped 100 mph and the geography of the Mayacama Mountains funneled those winds into Mark West Springs and the community of Larkfield-Wikiup. From there the fire pushed into the hills above Santa Rosa even as the Atlas fire was burning through some of the most storied vineyards in Napa County. After working its way across Riebli Road it made its way up Fountaingrove hill, above Santa Rosa, which is home to many of the area’s most affluent residents. Fountaingrove had burned once before, back in 1964; at the time, the area had not yet been residentially developed. The Hanley fire burned most of Fountaingrove over the course of four days. This time, what took four days to burn went up in just four hours. The fire consumed land and homes at an astonishing rate, burning an acre per minute. And while conventional wisdom holds that fires burn uphill, not down, the winds were so fierce it was driven down the other side of the hill, taking it into Journey’s End mobile home park and the edge of US 101. Around 2 am, the embers crossed over six lanes of traffic and burned down a Kmart and then turned the neighborhood of Coffey Park to ash. Residents who returned to their homes to sift through ash have reported finding solidified puddles of silver or aluminum; fire-proof safes were vaporized. Public facilities in Santa Rosa began to fill with evacuees, and area motels and hotels reached capacity on a weekday morning. The fires burned for more than a week before each was brought under control. Another week passed before CalFire began to report that individual fires had been extinguished. 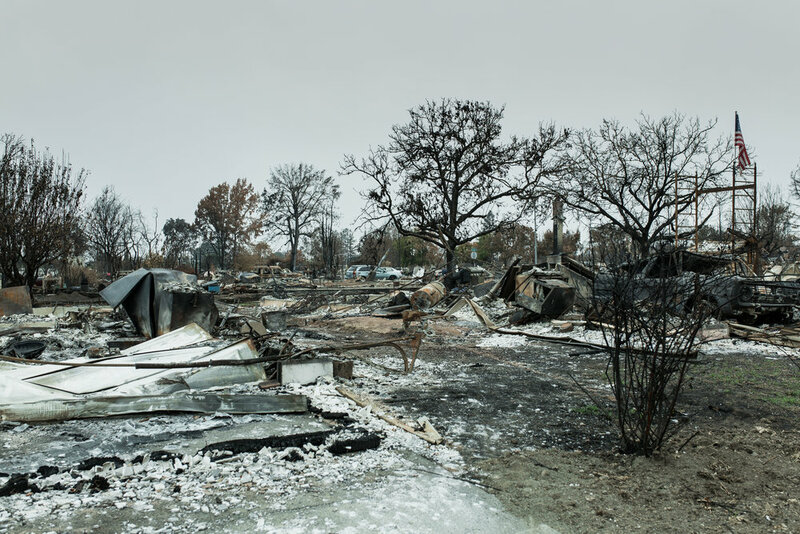 Tubbs fire was fully contained on October 31st after burning nearly 37,000 acres at a cost of $2.8 billion dollars. It is the costliest wildfire in California history. When the losses for Sonoma, Napa, Solano, Lake and Mendocino Counties are all added, the total is estimated to run $6-8 billion. Forty two lives were lost. An estimated 200,000 acres burned. Some 5700 structures were destroyed; most of these were single-family homes. When those building that sustained any damage are added in, the number rises to more than 14,000. Coffey Park neighborhood alone lost 1300 homes. The fires have caused a diaspora of Santa Rosa residents. Prior to the fires, the city had a 1 percent vacancy rate. The fires burned 5 percent of the city’s housing causing -4 percent inventory after the fires. Many residents have relocated to surrounding cities such as Sebastopol or Rohnert Park. Very few are still in Santa Rosa and many are paying rent north of $4000/mo. for a three-bedroom home. Even the most optimistic estimates suggest that the rebuilding will not be complete in five years.